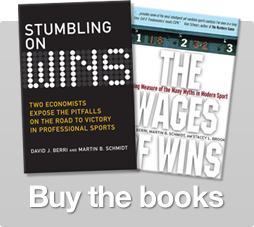 Today at 11:15 EST, Dave Berri talked with Kathleen Hays and Vonnie Quinn on Bloomberg Radio. The topic? Why the NBA Finals, of course! Dave often compares going on the radio to an exam; you have to know what you’re planning on talking about and have important details on hand in case the topic comes up. Because of this, Dave often prepares notes heading into an interview. Today we’ll show you the kind of notes that Dave prepares for a 7 minute interview. Everything that follows this sentence was in Dave’s notes for today’s interview! The lockout of 2011-12 was supposed to be about competitive balance. It certainly lowered player salaries and increased profits for teams. But competitive balance (as we would expect) did not change. We measure competitive balance by comparing the standard deviation of winning percentage to the standard deviation that would exist if teams were competitively equal. Prior to this season, this ratio had been 2.8 since the payroll cap was enacted in the early 1980s. This past year this ratio was 2.8. So the balance hasn’t changed. We can see a similar story when we look at who is in the Finals. Since 1984, the following teams have won titles: Celtics (3), Lakers (8), Pistons (3), Bulls (6), Rockets (2), Spurs (4), Heat (2), and Mavericks (1). So only 8 of the NBA’s 30 teams have won titles. And except for the Mavericks, all of these teams have won more than once. These trends will continue again in 2013. It’s important for fans to know that players are really only paid for the regular season. While there is a playoff bonus pool, it is quite small relative to a player’s salary. And since regular season salaries for players are capped, star players get very little monetary reward for advancing deep into the playoffs (except maybe more endorsements, although I am not sure the impact of winning a title on endorsement levels). In the regular season, Tim Duncan, Tony Parker, and Manu Ginobili were above average and produced 23.1 wins. But the team won 35 additional games, and 24.4 of these wins can be linked to the play of Kawhi Leonard, Danny Green, and Tiago Splitter. None of these players were lottery picks. Essentially, the Spurs have re-built a title contender without getting high draft picks or hiring expensive free agents. This illustrates that teams can build title contenders without losing a bunch of games or having a bunch of money. You just need to know how to acquire productive players (who are available after the lottery each year). After the Knicks lost to the Pacers in the second round, people have argued that Carmelo Anthony needs better teammates for the Knicks to win a title. But relative to LeBron, he already has better teammates. This past year, Anthony produced 2.2 wins in the regular season while his teammates produced 49.4 wins. LeBron James produced 20.0 wins while his teammates produced only 41.7 wins. So, the problem wasn’t Melo’s teammates. The problem is that Carmelo Anthony simply isn’t a great player. LeBron is easily the most productive player for the Heat. Chris Andersen – a mid-season acquisition – has been the second most productive player in the post-season. Andersen (who is not much of a scorer) has generally been productive across his career. Chris Bosh was only average in the regular season and he has been below average in the post-season. Norris Cole has been a surprise in the playoffs. He was the least productive player on the Heat in the regular season. In both the regular season and playoffs, the Heat were the better team. And they have home-court advantage. But the difference in these teams is small. So it’s not obvious who is going to win this series. In sum, the playoffs don’t “prove” anything. And we can’t “know” who is going to win before this starts. 4 Responses to "Notes on the NBA Finals"
TIME TO CELEBRATE FOR NUGGETS FANS!!!!! Heat in 5. I kid I kid. Thank you for doing a team perspective for the Finals. @Pete Read the comments on that article. Everyone thinks Karl is amazing even the guy who was complaining about Karl playing small ball. If Denver gets a halfway smart coach, they could be lethal next season. And if that happens I wonder if anyone will come back and talk about Karl not being as good as we all thought.